5 Power Tips: How Can Children Get Busy at Home? Has your toddler been surprising you with their wild imagination? This imaginative side of your child is fragile, but when cared for properly, they can be productive children and grownups through the years. To make the most of this specialty, try to incorporate important activities that will not only occupy your child’s mind but also their time, productively. As a leading provider of Child Care in Bronx, New York, allow us to impart with you these tips on how to help make your child productively busy at home. 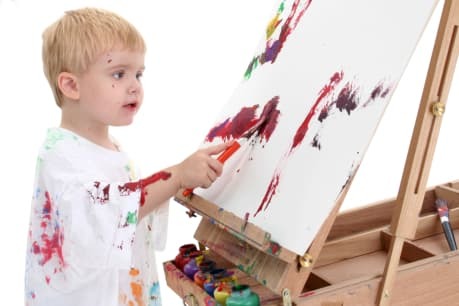 To encourage your child’s creative side, buy them art materials which they can use liberally. Just make sure these materials are age appropriate. Also, place them in a part at home where it’s alright to have colored stains on the floor. If there’s none, you can improvise by taping used papers on the floor so they can paint their preferred designs. When they’re old enough to manipulate colorful clay doughs, give them these as well. They can productively stimulate their imagination by creating anything they want to form with the clay. You can also practice your child with assisting you in doing home tasks such as preparing meals for the family. Aside from this being an opportunity for you to bond together, you can also teach them about safety in the kitchen. Again, it’s vital to note their age so that you can only assign tasks that are safe for their fragile hands. Another productive way you can occupy your child with is doing their chores. There surely are little things they can do just right for their small age. Help them fix their own beds, pick up their toys, or fold the clothes. While these activities may take a longer time to finish than usual, just think of it as an opportunity to train your child, something that they can’t get anywhere. Reading is also a productive occupation for your children. The closed equivalent is watching educational shows. The important element is that they’re acquiring quality information. Be their overseer when they read, such as recommending them what books or checking what show they’re watching. This way, you’re also them to evaluate their reading and viewing choices early on. You can also agree on working on a project together. For instance, if it’s your spouse’s birthday, you can plan for a surprise treat such as a birthday card which your child will be creating. Aside from this being creative enough, the personal appeal is also more touching. At Tender Years Childcare, we partner with you in building up your child. Our programs as a Day Care Center in New York is designed to bring out their productivity and creativity every time. If you’re interested in these programs, don’t hesitate to inquire from us. This entry was posted in Child Care and tagged child productivity, children activities, day care center. Bookmark the permalink.